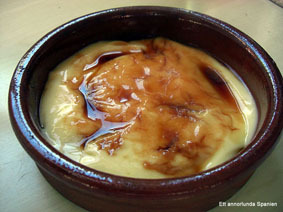 The origin of Crema Catalana, with a scent of lemon and cinnamon, is Cataluña, but it is being served every were in Spain. In the original recipe it is served with a crispy caramel coating. I prefer to sprinkle cinnamon on the top to reduce as much sugar as possible. 0,5 cups of sugar, and, if desired, 0,5 additional cup for caramelization. Mix the milk, lemon peel, and cinnamon stick in heavy medium saucepan. Bring to boil. Reduce heat to low and simmer 10 minutes, stirring occasionally. Remove from heat. Drain from lemon peel and the and cinnamon stick. Beat the egg yolks, corn flour and sugar in the saucepan. Gradually whisk in the milk mixture. Cook over medium heat until mixture boils, whisking constantly until creamy. Pour mixture into individual serving bowls and keep in refrigerator. Sprinkle cinnamon on top before serving or make caramelized sugar, se below. Caramelization: Pour 1/2 cup of sugar into a frying pan. Heat on low temperature, stirring constantly until the sugar has melted and is golden brown. Do not burn! Pour the caramelized sugar on top of the cold cream and serve.